The Direct-To-Consumer strategy lifestyle is a busy one. Frequently, we’re not in the studio to do our Facebook Live shows, because we’re on-set filming a show for one of our many clients. But just because we are away from the home base doesn’t mean that we are going to skip out on talking business and espousing the virtues of Direct-To-Consumer! 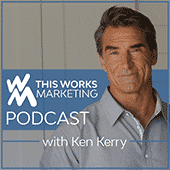 In this episode, Ken talks about how companies can use an omni-channel approach to mitigate scandals in one part of their marketing. Just because a platform like Facebook might be having issues, doesn’t mean your marketing efforts can take a backseat.